This page contains a list of military tactics. The meaning of the phrase is context sensitive, and has varied over time, like the difference between "strategy" and "tactics". Exploiting prevailing weather – the tactical use of weather as a force multiplier has influenced many important battles throughout history, such as the Battle of Waterloo. Fire attacks – reconnaissance by fire is used by apprehensive soldiers when they suspect the enemy is nearby. Force concentration – the practice of concentrating a military force against a portion of an enemy force. Night combat – combat that takes place at night. It often requires more preparation than combat during daylight and can provide significant tactical advantages and disadvantages to both the attacker and defender. Reconnaissance – a mission to obtain information by visual observation or other detection methods, about the activities and resources of the enemy or potential enemy, or about the meteorologic, hydrographic, or geographic characteristics of a particular area. Smoke screening - the practice of creating clouds of smoke positioned to provide concealment, allowing military forces to advance or retreat across open terrain without coming under direct fire from the enemy. Fire and movement (also known as leapfrogging) – working in 'fire teams', one team attempts to suppress the enemy while the other moves either toward the enemy or to a more favourable position. Basic drill – a standard drill that all individual soldiers are supposed to perform if they come under fire. Penetration of the center: This involves the creation of a gap in the enemy line and its exploitation. Two ways of accomplishing this are separating enemy forces and using a reserve to exploit the gap that forms between them (e.g. 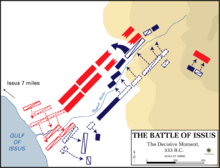 Battle of Chaeronea (338 BC), the first recorded use of the penetration of the center) or having fast, elite forces smash at a specific point in the enemy line (an enemy weak spot or an area where your elites are at their best in striking power) and, while reserves and holding forces hold your opponent, drive quickly and immediately for the enemy's command or base (i.e., blitzkrieg). Attack from a defensive position: Establishing a strong defensive position from which to defend and attack your opponent. However, the defensive can become too passive and result in ultimate defeat (e.g., Siege of Alesia and the Battle of the Granicus). Single envelopment: A strong flank beating its opponent opposite and, with the aid of holding attacks, attack an opponent in the rear. Sometimes, the establishment of a strong, hidden force behind a weak flank will prevent your opponent from carrying out their own single envelopment (e.g., Battle of Rocroi). Double envelopment: Both flanks defeat their opponent opposite and launch a rear attack on the enemy center. Its most famous use was Hannibal's tactical masterpiece, the Battle of Cannae and was frequently used by the Wehrmacht on the Eastern Front of World War II. Attack in oblique order: This involves placing your flanks in a slanted fashion (refusing one's flank) or giving a vast part of your force to a single flank (e.g., Battle of Leuthen). The latter can be disastrous, however, due to the imbalance of force. Feigned retreat: Having a frontal force fake a retreat, drawing the opponent in pursuit and then launching an assault with strong force held in reserve (such as the Battle of Maling and the Battle of Hastings). However, a feigned retreat may devolve into a real one, such as in the Battle of Grunwald. Indirect approach: Having a minority of your force demonstrate in front of your opponent while the majority of your force advance from a hidden area and attack the enemy in the rear or flank (e.g., Battle of Chancellorsville). Crossing the "T": a classic naval maneuver which maximizes one side's offensive firepower while minimizing that of the opposing force. Blitzkrieg – a method of warfare whereby an attacking force is spearheaded by a dense concentration of armoured and motorized or mechanized infantry formations, and heavily backed up by close air support. Carpet bombing – also known as saturation bombing, is a large aerial bombing done in a progressive manner to inflict damage in every part of a selected area of land. Holding attack – to hold the enemy in position while other offensive or defensive activity takes place. Pincer movement – an army assaults an enemy by attacking two sides at opposite locations, often planning to cut off the enemy from retreat or additional support in preparation for annihilation. Bull horn formation – an army assaults an enemy force by sending troops to the enemy's flanks and by attacking their front attacking three areas at once, often planning to cut off any retreat or support as well as confusing the enemy in preparation for annihilation. Raiding – a small team is inserted deep behind enemy lines to capture a high-value individual or destroy a vital enemy installation then extracted before the enemy can respond. Deception: Sun Tzu said that all war is based on deception back in the 4th century BC; a wise commander takes measures to let his opponent only react to the wrong circumstances. Diversionary attacks, feints, decoys; there are thousands of tricks that have been successfully used, and still have a role in the future. Perfidy: Combatants tend to have assumptions and ideas of rules and fair practices in combat, but the ones who raise surrender flags to lure their attackers in the open, or who act as stretcher bearers to deceive their targets, tend to be especially disliked. False flag: An ancient ruse de guerre – in the days of sail, it was permissible for a warship to fly the flag of an enemy power, so long as it properly hoisted its true colors before attacking. Wearing enemy uniforms and using enemy equipment to infiltrate or achieve surprise is also permissible though they can be punished as spies if caught behind enemy lines. Demoralization (warfare): A process in psychological warfare that can encourage them to retreat, surrender, or defect rather than defeating them in combat. Radio silence – while traveling, a fleet will refrain from communicating by radio to avoid detection by enemy forces. ^ Doughty, Robert. "Weather in War". The History Channel. Archived from the original on 13 October 2013. Retrieved 13 December 2013. ^ "SOME JUICY QUOTES FROM CLAUSEWITZ, ON WAR". The Clausewitz Homepage. Retrieved December 13, 2013. ^ Toppe, Alfred. Night Combat. Google books. Retrieved December 13, 2013. ^ Field Manual (FM) 7–92: The Infantry Reconnaissance Platoon and Squad (Airborne, Air Assault, Light Infantry). United States Army. 2001. p. 4.0. ^ Gooderson, Ian (1997). Air Power at the Battlefront: Allied Close Air Support in Europe, 1943–45 (1. publ. ed.). London: F. Cass. p. 129. ISBN 0-7146-4680-6. This page was last edited on 9 March 2019, at 09:27 (UTC).